Photo by Emilie Lemons from Mummy's Gin Fund. The Roald Dahl Museum and Story Centre celebrates the writer and his books, as well as the arts of storytelling and writing. With something for all ages, two galleries – ‘Boy’ and ‘Solo’ – illustrate Dahl’s biography, including his schooling and his time in the airforce. 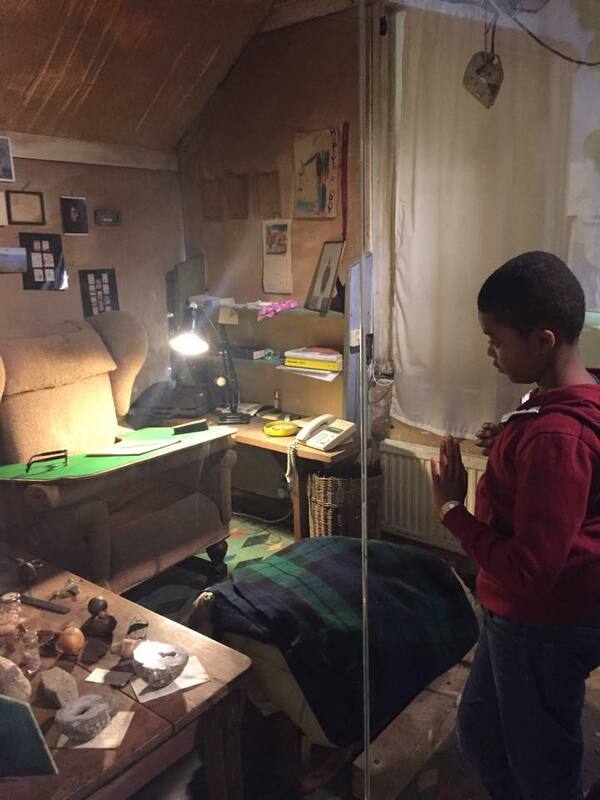 His famous writing shed has been dismantled and rebuilt in the museum, while a replica of his special writing chair and desk is one of many interactive displays where visitors are invited to let their imaginations run free. I visited the museum on the last day of the summer holidays with my two boys, aged one and 10. Whilst the train journey out of London was a little bit of a mission, we enjoyed a great day out. The first two galleries are full of information, much of which was a little too detailed for my 10 year old, but with plenty of installations and interactive stuff for him to play with while I, also a lifelong Dahl fan, took the rest in. The real fun starts in the Story Room where there are enough activities provided to fill a couple of hours with ease. In spite of my autistic stepson’s relatively short attention span, he was fully engaged throughout and I regretted having only left two hours to make the visit – we were forced to leave without seeing everything, so will certainly make the trip back. Watch out for the gift shop at the end of your tour which, in addition to stocking Dahl’s catalogue, has a whole array of teddies, mugs, gift sets and T-shirts for you to say ‘no’ to! Address: Roald Dahl Museum and Story Centre, 81-83 High Street, Great Missenden, Buckinghamshire, HP16 0AL. Cafe: Cafe Twit offers very reasonably priced and healthy food with a Roald Dahl theme. The menu is simple – paninis, jacket potatoes and sandwiches with Bogtrotter Chocolate Cake a favourite for dessert. All food is made on there and the staff will do their best to cater to special dietary requirements, including gluten-free. Toilets: Three clean and fully accessible toilets with baby change. Pram / wheelchair / mobility friendly: A ‘buggy room’ is provided, where buggies can be safely left. The museum itself is at ground floor level with step-free access to everywhere except the cafe, which has a small step. There are accessible toilets and baby change. Some craft activities take place upstairs. On our visit staff were very helpful, accompanying me and my pram to the lift and guiding me through the administrative rooms to the workshop. Parking: A pay-and-display car park is located a five minute walk from the museum. Nearest station: Great Missenden is less than a five minute walk from the museum. A regular service takes approximately 45 minutes from London Marylebone. The station at Great Missenden is accessible from both sides. Bus: Arriva runs a regular bus service between Great Missenden and High Wycombe from Monday to Saturday. Buses 48 and 55 serve Great Missenden. Email: Via form on website: www.roalddahl.com/global/contact-us/contact-form. The ‘story room’ at the back of the site is a gallery full of interactive games and activities giving an insight into how Dahl, along with contemporary children’s authors, came up with stories and illustrations. Here, visitors can make a stop-frame film, invent new Dahl-style words and dress up as characters from his books. The gallery is also home to George’s Crafty Kitchen, where children can take part in drop-in crafting sessions. Activity sheets engage visitors in creative writing and illustration. Staff are around throughout the museum to inspire and assist. The museum also runs regular storytelling sessions and craft workshops. A full programme of what is on day-to-day can be found on the museum website. Admission costs: £6.60 for adults, £4.40 for children and concessions (September 2015). Carers and children under five go free.